Spend time in Nature, Make memories with your Family. On Free Fishing weekend we left town and headed to Grand Haven for a couple of days. 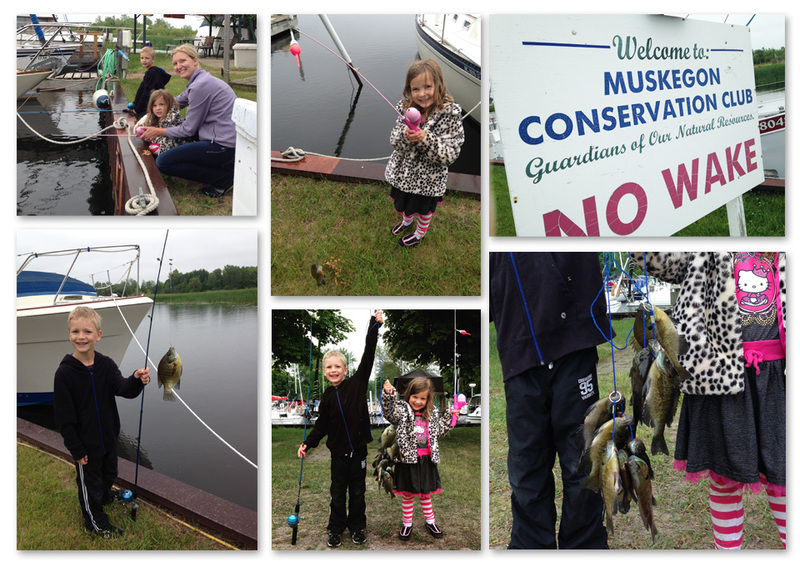 Lucky for us the Muskegon Conservation Club was holding a free fishing derby for children on Saturday morning. We arrived at the club a bit early to register and were able to walk the grounds a bit before fishing started. We spotted a couple of birds while there including a Baltimore Oriole and her nest hanging right near our van. Each child was given a stringer, a piece of tackle, a raffle ticket and bait (10 wax worms). We had to provide our own poles and got to pick out a spot anywhere on the Club’s property. We picked a spot near the river and when fishing started moved around a little until we found a great spot between a couple of sailboats. Our son caught the first fish for our kiddos and caught six total. He ended up in fourth place after a few boys caught seven and one boy caught eight! Our daughter caught four and won third prize for her age group. She was awarded a bag full of prizes including new lures, sinkers, sunglasses, sidewalk chalk, a jump rope and a puzzle! The Club awarded prizes to the top three (most fish) in each age group, and prizes for the smallest fish (which was about an inch long and looked like bait) and the biggest (a dogfish). We released our fish back into the marina for some other lucky angler. The raffle prizes were quite impressive and included large nets, many lures, rod and reel sets, children’s rods and toys. Our kiddos picked lures (our son really wants to catch a pike, so he picked a ‘pike lure’). The Conservation club also offered a free yummy lunch of hot dogs, chips, lemonade and watermelon to all the participants, including parents! We had a fantastic time at the derby and it has given our kids an even deeper love for fishing. Thank you so much Muskegon Conservation Club!